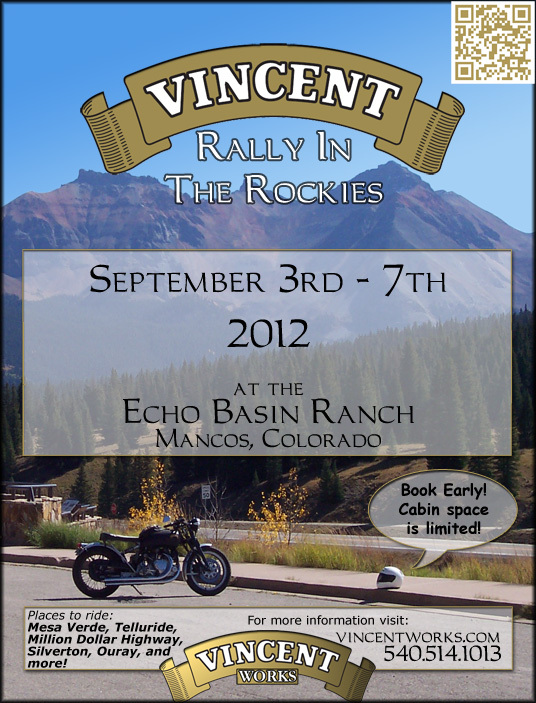 To be held at the Echo Basin Ranch, near Mancos, Colorado. This five day event will certainly be something to remember! Cabin space is limited, please reserve early. On-site camping is also available. Contact information and maps below. Check back for more information! Monday, September 3rd: Sign in, Picnic/Cookout! ~Self guided tours (maps and chase truck will be available). Tuesday, September 4th: Shop Tours! ~Vincent Works and Colorado Norton Works. ~BBQ Dinner, Guest speaker at the bar. ~Chicken Dinner, guest speaker at the bar. Thursday, September 6th: Line Up! The bar will stay open, as needed. Breakfast and lunch are not provided. The Vincent Works shop is available for storage and repairs. REGISTER SOON, SPACE IS FILLING FAST! CLICK HERE FOR OUR REGISTRATION FORM! Please see our Facebook Events Page for the latest news!